After an ICO has closed, the next key moment is when the token becomes tradable on crypto exchanges. In this article, we’ll list 5 exchanges that every ICO investor should know in order to be successful at ICO investments. Are these the only crypto exchanges out there? By no means. Coinmarketcap lists nearly 200 exchanges where you can buy and sell cryptoassets. Hence, think of this as a starting point. We encourage our readers to do your own research in selecting the exchanges that suit your needs. 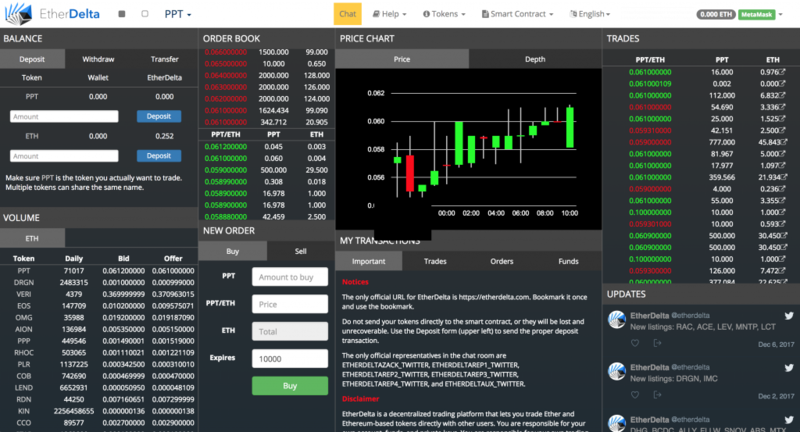 EtherDelta is a decentralized crypto exchange for ERC20 tokens. This effectively means that you can instantly buy and sell Ethereum-based tokens, without having to sign up. Instead of creating an account, you use Metamask to place transactions on the Ethereum blockchain. In principle, you can trade any transferrable ERC20 token – even without EtherDelta having listed it. You simply add the smart contract address to the interface. In practice, however, EtherDelta will typically be among the very first to explicitly list new ERC20 tokens, once they have become transferrable. Since the majority of tokens from ICOs are indeed ERC20 tokens, EtherDelta is a must for ICO investors who are looking to trade their tokens shortly after they’re transferrable. It’s worth noting that since EtherDelta transactions are made on the Ethereum blockchain, there’s a higher cost associated with trading. Even placing an order has a cost – you’re paying for the gas needed to execute transactions on the Ethereum blockchain. Because of this, EtherDelta has a lower liquidity than many of the centralized exchanges. The benefit of EtherDelta being decentralized – as with all decentralized applications – is that it does not have a single point of failure. In other words, it’s less prone to attacks of the type Mt Gox suffered in 2014. Binance, in contrast to EtherDelta, is a centralized exchange. From a practical point of view, this means you have to create an account in order to trade. It also means there are lower costs for trading, since Binance maintains its own private ledger instead of executing trades directly on the Blockchain. 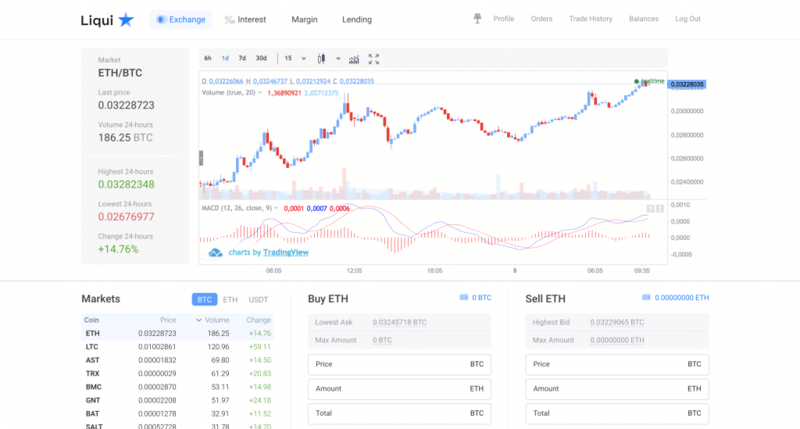 Furthermore, Binance lets you trade more than just ERC20 tokens – here you can also trade coins like bitcoin, litecoin, and many others. 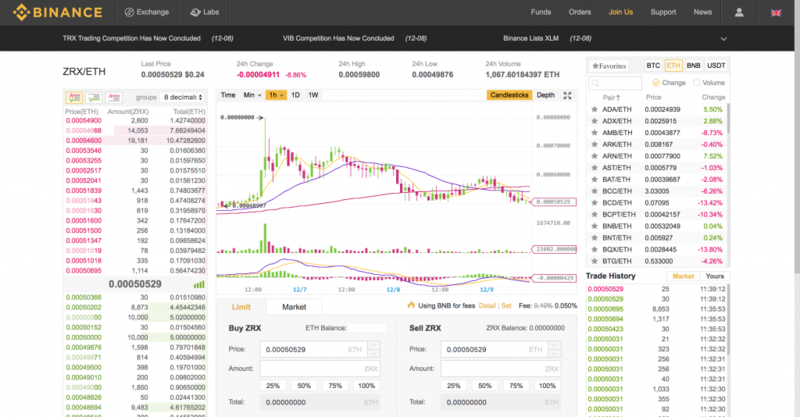 At the time of writing you can trade almost 200 different coins on Binance. Binance has relatively low trading fees, and if you purchase their own Binance Coin (BNB), you can use this token to pay for fees, at a 50% discount. On some occasions, when tokens have been launched on Binance, they have dropped in price. Some ICO investors have referred to this as “the Binance curse”. It’s worth noting that this has certainly not happened for all coins – Quantstamp being one example where the price significantly increased after being launched on Binance. Bittrex is the biggest exchange on this list in terms of selection of coins. 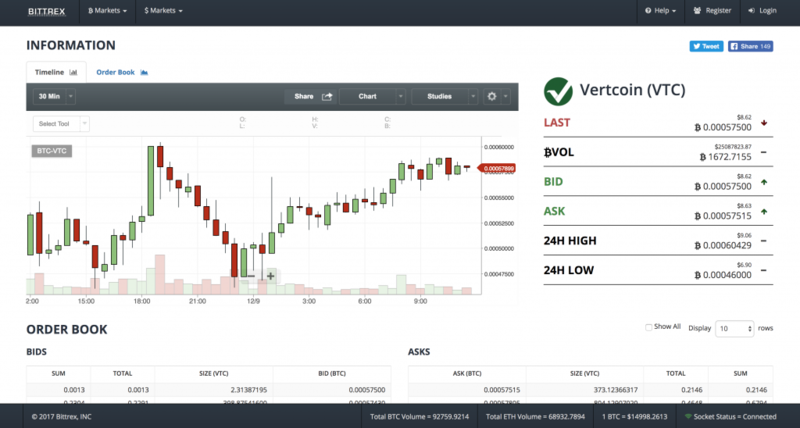 At the time of writing, nearly 300 different coins have been traded in the last 24 hours. One example of a token that was first listed on Bittrex is Ripio Credit Network. Bittrex has a transaction fee of 0.25%. Since this is paid by both “makers” and “takers” in a trade, Bittrex is certainly not the cheapest exchange to trade on. However, with its high volume and high selection of coins, Bittrex is certainly a crypto exchange that ICO investors should know. Liqui is the smallest centralized exchange on this list in terms of transaction volume, but it’s worthing being aware of, as it has been the first centralized exchange to feature some successful tokens. One example is Kyber Network. Liqui has a clean and simple user interface, and in our experience rarely suffers from downtime or technical issues. A downside of Liqui is that it has relatively high withdraw fees, depending on the token. Similar to Bittrex, Liqui has a transaction fee of 0.25% for both “makers” and “takers”. You might have noticed that none of the crypto exchanges mentioned so far allow for trading in fiat currencies. 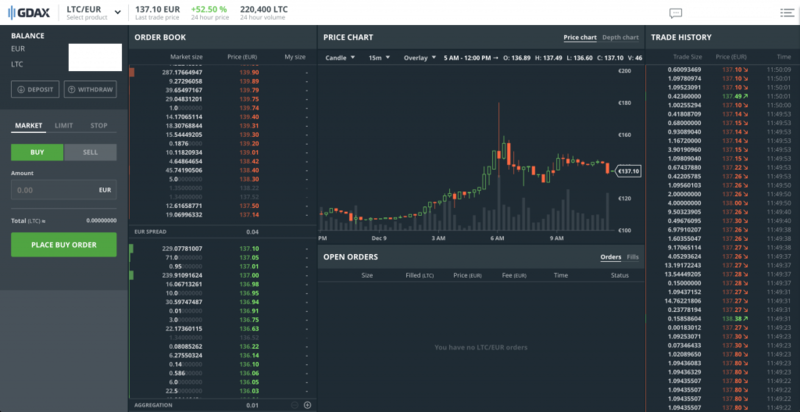 GDAX allows for trading between US dollars (USD), euro (EUR), bitcoin (BTC), litecoin (LTC), and ether (ETH). You could describe GDAX as the more sophisticated version of Coinbase, and it’s actually owned by Coinbase. A consequence of this is that GDAX and Coinbase share the same liquidity pool. The difference is that Coinbase is targeted towards the retail market (with exceptional success) and has higher fees. GDAX on the other hand, lets you trade without fees when you’re the “maker”. When you take the role of a “taker” you pay up to 0.3% in fees. Do you agree with this list of 5 crypto exchanges every ICO investor should know? What exchanges do you frequently trade on? Let us know in the comment field below.